Fill a five-ounce glass with ice. Add grenadine, Torani Amer and soda water. Stir. Top with brandy. Add the lemon twist. Serve. Several years ago, I co-authored a book, Endless Nevada, with photographer Larry Prosor. 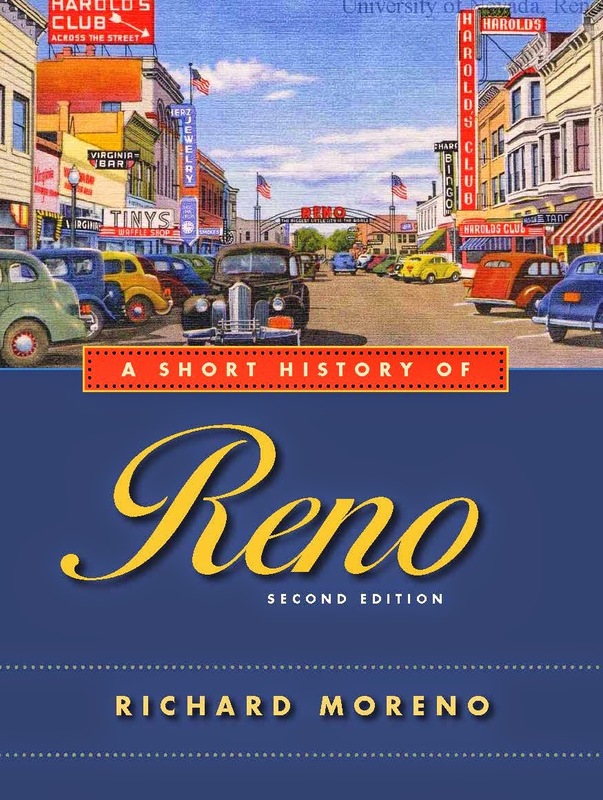 One of the chapters in the book spotlighted Nevada's Basque restaurants. The book is now out of print, although you can find copies online, so I thought I'd share part of that chapter, which was titled, "Mealtime." You can never eat alone at a Basque hotel. One of the unique aspects about dining at one of the dozen or so authentic Basque boarding houses found in Nevada is that the meals typically are served in an intimate, family-style. You sit down at a long table, usually covered with a red-and-white-checked tablecloth, and are proffered food while sitting with a bunch of strangers. You can find yourself seated adjacent to anyone from a visiting mining engineer to a local insurance salesman. The Basque hotel developed in the late nineteenth century to offer a home away from home for the many Basques brought to the American West to tend the growing flocks of sheep appearing on the open range. Basques come from an area in southwestern Europe that encompasses the crest of the Pyrenees mountains and part of the coast of the Bay of Biscay; it straddles the border of modern France and Spain. Basques speak a unique language, unrelated to other European tongues, and, it has been said, have never been truly tamed by any monarch or country. The first Basques arrived in Nevada in the 1890s, during a time when the state's vital mining industry had begun to wane and agriculture was becoming more important. A common myth is that the Basques coming to the west were already professional sheepherders. William A. Douglass, a retired University of Nevada Reno scholar, who has studied Basques in the west, notes that, contrary to that image, most were merely poor, relatively uneducated and rural. While their rural background provided them with skills in handling livestock, they were generally successful because they were ambitious and worked hard under extremely difficult conditions. The sheepherder had little social status. In the American West, sheep were considered far less noble than cattle. To be a sheepherder was to be doing something beneath the dignity of most—which made it a job usually reserved for foreign immigrants, like Basques. On the other hand, it was perfect work for a newly-arrived Basque. He didn't need a formal education, didn't have to know English and, if he worked hard, could make enough money in a couple of years to purchase his own sheep and expand his horizons. Within a short time, the sheepherder might be able to bring a relative or friend from his Basque homeland, and the latter would repeat the pattern. The work was demanding and lonely, requiring the sheepherder to spend months in the most remote parts of Nevada, without much companionship. As a result of such conditions, it was almost impossible for most Basques to learn the language and assimilate into American society as did members of most other immigrant groups. Obviously, opportunities for establishing a family were also extremely limited. Most Basques looked upon their American experience as little more than an opportunity to escape poverty at home, then make enough money to return there to buy a farm or other business (the Basques called these returnees, "Amerikanoak"). Because of the difficulties of assimilating, and the attitude that a couple of years in Nevada was a temporary assignment, Basques retained a strong sense of cultural identity. All of these factors helped create the Basque hotel. Not every Basque immigrant returned to the Pyrenees. Some sent for wives and family and chose to establish businesses in America, including small hotels and boarding houses. These became the focus of Basque culture in a community. Sheep men, down from the hills, would flock to the hotels for warm meals, soft beds and opportunities to catch up on news from home, read Basque newspapers and speak in their native tongue. By the beginning of this century, Basque boarding houses had cropped up in a number of Nevada communities, including Winnemucca, Elko, Reno, Ely, Carson City and Gardnerville. Of course, they didn't cater only to Basques but encouraged business from anyone seeking a bed for the night and a good, hot meal. A few years ago, I decided to have dinner at the Ely Hotel, a small Basque boarding house and restaurant that used to be in the center of the former copper mining town of Ely. I was early and the owner hadn't yet set up for dinner, so I sat at the bar to wait and ordered a Picon punch. Now, a Picon punch is powerful drink. A bartender will tell you it's made of a liqueur named "Amer Picon" or “Torani Amer” (a bittersweet orange cordial unrelated to the pecan) mixed with grenadine, often fortified with brandy. One Picon punch will make you late for dinner. Two will have you arguing with the bartender about the unification of Europe and after three, you'll be singing the Basque national anthem while cursing the memory of Franco. No one has ever walked away hungry from a Basque meal. In addition to seemingly endless courses, the meals include as much of any particular dish as you wish to eat. Specific types and flavors of food may vary, but at a typical Basque restaurant, they'll start you off with a basket of fresh French bread and butter, followed by a tureen of soup, followed by a large bowl of salad, followed by a plate of spaghetti or vermicelli or some other pasta, followed by a bucket of beans, followed by platters of French fries, followed by another side dish, usually with vegetables, followed by the main dish, generally a huge slab of marinated and broiled beef or lamb steak. After that feast, some restaurants will bring you sliced apples and cheese and ask if you'd like a bowl of ice cream. At some point in the meal, the waitress or waiter will also bring you a carafe of hearty red wine. Obviously, the secret is to pace yourself. Sometimes, it's best not to know what you're being fed. Basque cuisine varies as a result of provincial differences (e.g., coastal Basques serve more fish while mountain folks tend toward beef and lamb). Naturally, in Nevada, the Basques have adapted to their surroundings. Therefore they serve not only a lot of beef, pork and lamb dishes but also rabbit, trout and a subcategory I call "entrail food." The latter include such delicacies as sweetbreads (animal pancreas), tongue and "mountain oysters" (bull or sheep testes). Of course, you never know who you will sit next to during one of these Basque culinary overloads. Once, in Ely, I found myself next to three visiting oil engineers who had been testing an area for oil reserves. Their talk of sonic thumpers and other electronic wizardry turned out to be far more interesting than the day-old newspaper (the only kind you can get out there) I'd planned to read. But I left after they'd finished their third Picon punch and were beginning to sing.